The game is colorful, at least. If you’re not up to date with the goings on among the Nintendo faithful, this might come as a shock, but Nintendo kind of has a Mario problem. Or, rather, a Paper Mario problem. Now, back in 2000, Nintendo and developer Intelligent Systems released Paper Mario, a turn-based RPG game featuring Mario and a design hook: all the environments and characters would appear like paper dolls. It was a novel trick and backed up by a tried and true gameplay system, and it’s one of my favorite childhood games. In 2004, Paper Mario: The Thousand Year Door was released as a follow up, doubling down on everything that worked before while adding a stronger story and character beats. Bowser was also playable. If fans of the game are to be believed, it was the best Mario game released of the Gamecube era. Sales disagree. Either way, Paper Mario was shaping up to be a brand new Mario tentpole to hold up the House of N alongside the Karts, Parties, and Smashes. Then 2007’s Super Paper Mario happened. Eschewing the turn-based structure and adding traditional Mario platforming soured a lot of long time fans, even if the game maintained a certain level of quality expected. 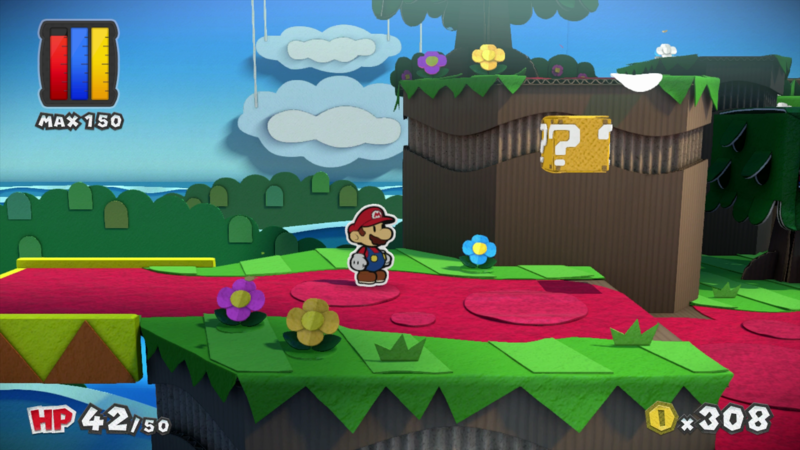 Fans took particular issue with a feature within the game that allowed the 2D Paper Mario to transition to a 3D landscape to further explore. From one perspective, the idea is just as nominal as the original idea to flatten the characters, but some players considered it a gimmick rather than a selling point. It is at this point that fans and the developers found themselves at an impasse. Where players wanted a more refined and rich Thousand Year Door, Intelligent Systems (and by extension, Nintendo), wanted to keep reinventing the wheel with the Paper Mario line as a new RPG series had begun called Mario & Luigi. Intelligent Systems decided to try again in 2012 on the 3DS with Paper Mario: Sticker Star, which ended up falling flat on its face. Turn-based battles returned, but all actions were now governed by single use stickers which quickly depleted, leaving Mario useless. The stickers were an effort to bring in three dimensional objects to the 2D world for a gag, but it wasn’t worth the joke. 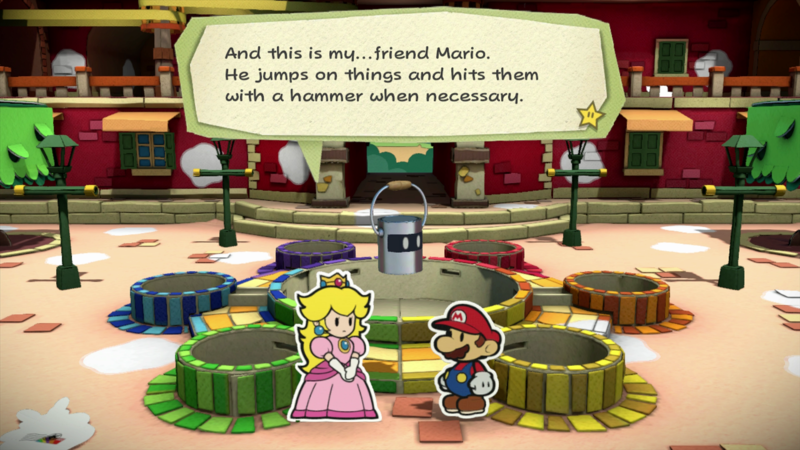 Paper Mario did make a cameo appearance in the Mario & Luigi series in 2015, but that was much more a game in that franchise than a Paper Mario title. All this time, fans continued to clamor for another Thousand Year Door. That massive history lesson is important to understand the situation that Paper Mario: Color Splash is released into. Once again, the series proves to be stuck ever more between its accomplishments and its desire to change, none of which is helped by the fact that this will likely be the last large Wii U release of the console’s life. * On the one hand, turn-based battles are indeed back again and are less painful, but on the other hand there is still no experience system and stickers are replaced with cards. The good news to that is there is a sense that Intelligent Systems learned from the mistakes of Sticker Star. Cards are far more plentiful than stickers were. They are also designed for longevity: some cards deal multiple hits or target multiple foes by default. This prevents over using the resources available to players and allows more powerful cards to be reserved for tougher match ups. Additionally, if inventory does run out, there is now a built in fail safe to get a smattering of basic cards in an emergency. The cards themselves are secondary to Color Splash’s main mechanic: the use of paint. Mario’s hammer is given the ability to bring color to the game’s world and to power up battle cards. The fact that colored paint transcends battle and becomes a resource for progression in the game’s world goes a long way into making things feel more organic and less like a gimmick. Paint is available everywhere, from defeating enemies, finding items (the 3D objects from Sticker Star return), and even hitting already colored objects will net a refill on color. 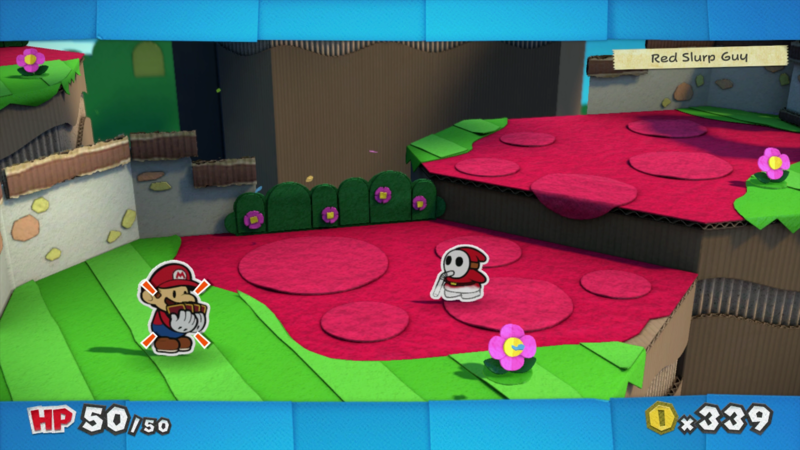 Mario’s hammer can be upgraded to hold more paint via picking up fragments, though this and occasional health increases are really the only way to grow Mario as a character. More conventional RPG elements like leveling or parties are nowhere to be found. Color Splash leans more on Super Paper Mario for its overall execution. Mario will adventure from level to level across a map familiar to classic Mario game fans. More worlds are opened up as paint versions of the iconic stars are found. The catch is that many worlds have multiple paths to multiple stars, and many will require a return trip after other events in the game. While it can be frustrating to hit a wall when trying to progress, the game is pretty fair about dropping the right amount of hints as to where to maneuver next without outright giving up the gambit. As for each level, expect pseudo-platforming with stops to battle enemies in the turn-based menu. Quite frankly, while the first couple of Paper Mario titles got away with it due to the level design being more-or-less open world, entering battle quickly becomes a chore, especially against weaker enemies. As the game progresses, Mario gains the power to knock out enemies with a single hammer swing or jump without having to change menus, but it doesn’t occur efficiently enough to offset the inconvenience. As for the battle menu itself, it’s simple enough to grasp, yet falls victim to the need to implement the Wii U gamepad. The touch screen must be used to select cards for battle, then you have to hold down on each card to color it in if it is not already, and then you must make a forward motion to make the cards ‘appear’ in battle. If that sounds tedious, that’s because it is. Making it further into the game only made me want to avoid battle more and more, even as more interesting variations of classic Mario foes appeared. One liners aren’t the only things Color Splash has going for it. The paper doll gag still has life, with characters getting crumpled into balls, folded, soaked, and more for a good balance of slapstick to the dialog. Sometimes the very situation is made fun of. For example, Princess Peach is not kidnapped at the start of Color Splash but ends up getting faked out a few hours into the game as she’s nabbed by a black paint covered Bowser. What follows is the game effectively looking at the player going “Yes, we know.” A real breath of fresh air comes from Mario’s new sidekick, a paint can named Huey. 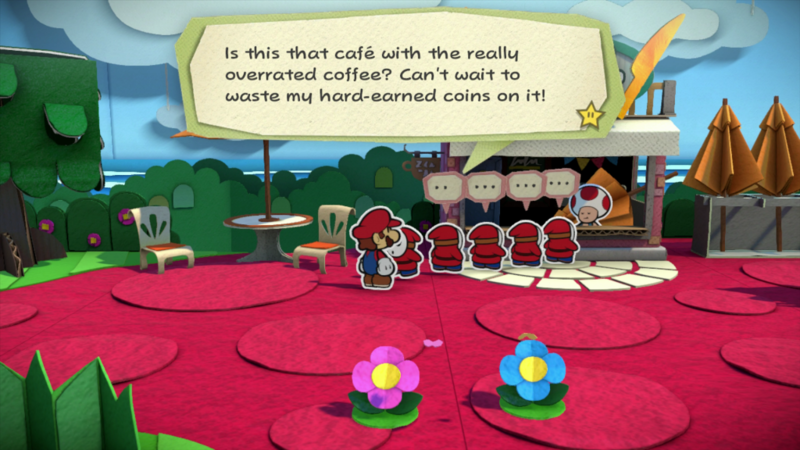 Unlike other characters filling such a role, Huey has a passive-aggressive streak that manifests throughout the game to act as a better reactionary than Mario himself. Huey gets some of the game’s best moments, mostly because he hates even having to do what he’s doing. Huey is hardly the only worthwhile character to hear out. 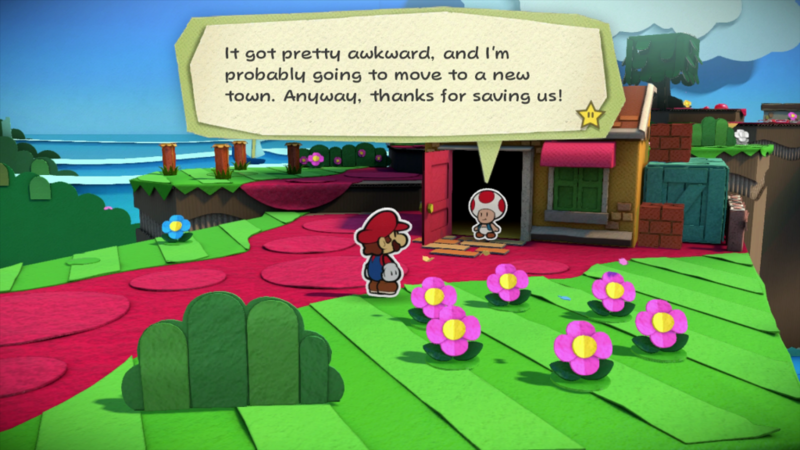 Throughout the game, Toads will need to be rescued by restoring color to them. Doing so nets unique dialog for each one discovered. Some will tell you whatever situation led to their color being stolen, other will have reactions to the idea of being saved by Mario at all. Others can even come together to help get to the end of levels or access areas that previously couldn’t be reached. In spite of looking or like (possibly because of it), the interactions with the Toads end up being the least repetitive part of Color Splash, even as a whole lot of them need rescuing. Toads are also the only characters Mario encounters frequently enough to be classified as recurring, so the deviations in show up with the necessary NPCs encountered as well. If there is any defining strength of this title, the superb use of personality is surely it. All of this is set against a truly gorgeous setting. Naysayers will knock the Wii U’s power long after it is gone, but Nintendo’s teams have always been capable of creating beauty with what they had. Color Splash is no exception. The flat landscape allows for details to be filled in with care, such as corrugated cardboard ridges and vibrant colors jumping out. 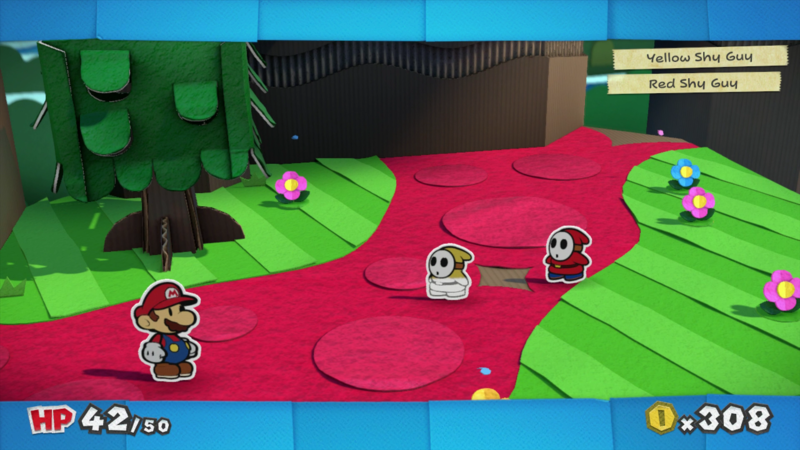 Each level feels like a brand new diorama has been put together to play out some Mario fanfiction. All of this is displayed without inconveniences like framerate drops or dips in quality, even if that consistency requires loading screens to offset. Loading screens themselves are fairly short, but also create the game’s biggest irritation. Actually dying in the game is quite difficult as cards and paint are provided in abundance, but environment hazards can result in an instant game over. For some inexplicable reason, game over screens force back to the title screen and the entire save file has to be re-loaded. Since save points usually come before these hazards and they eventually have to be overcome, the biggest challenge is keeping patience while reloading the game. One instance had me fleeing a loose Chain Chomp on a non-linear path that took me a few tries to understand I needed cover instead of continuing to run. With the extra load time, this 45 second sequence ate 45 minutes of my time. Paper Mario: Color Splash is a difficult game to recommend, to be honest. As fun as the humor and characters are, they can’t completely make up for tedious gameplay and other irritations. What might be worse is that it’s almost impossible to pinpoint exactly what the issue with the gameplay is, knowing that the team has made efforts to fix it in the aftermath of Sticker Star. Devout fans will take issue with most of the game’s focus and the watered down combat, but the less passionate will find the turn-based combat slow while loving the focus on irreverent humor. 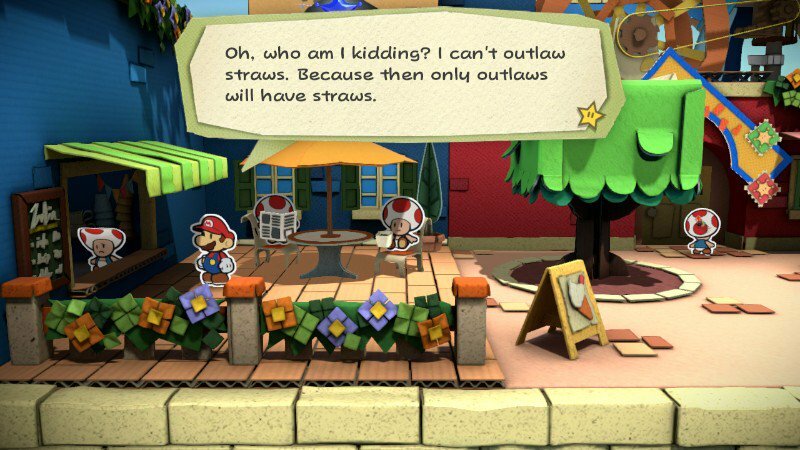 Altogether, this just highlights the issue that this particular franchise is stuck in: Should Paper Mario lean harder on its legacy, or finally dive headfirst into the unknown? I don’t really know what the correct answer is, but I do know I still want more Paper Mario after playing Color Splash. A game that is willing to have fun with itself is a game deserving of a shot. Besides, it’s not nearly as bad as Star Fox Zero; so the Wii U won’t go out on that at least. *Yes, Nintendo does plan on releasing The Legend of Zelda: Breath of the Wild for the Wii U still, but that is planned as a split release for the Nintendo Switch and production for the Wii U will be ending in December. At this point, releasing the Wii U version is more a reward to the faithful than a console selling release.